There have been many reincarnations of London Bridge since the original Roman crossing in 50 AD. Constructed out of wood, early versions of London Bridge were susceptible to fire, storms, and occasional invading armies. In 1176, the first stone bridge was built under the direction of Peter Colechurch. It was common in those days for men of the cloth to design buildings as they were taught the art of building arch structures out of stone in the Monastic Orders. Completed in 1209, this new London Bridge took 33 years to build and lasted more than 600 years. The bridge was some 8 meters (26 feet) wide, and about 240–270 meters (800–900 feet) long, supported by 19 irregularly spaced gothic arches, founded on starlings set into the river-bed. It featured a central chapel, a host of shops and houses (the rent from which funded its construction and upkeep), gates, a drawbridge – even waterwheels and a mill. The houses were up to seven storeys high and jutted over the river by as much as 2 meters (6.5 feet) on either side. Many practically touched in the middle, making the bridge more of a tunnel in places. The bridge became the site of calamities. In 1212, perhaps the greatest of the early fires of London broke out on both ends of the bridge simultaneously, trapping many people in the middle. In 1282 five arches collapsed under the pressure of winter ice. Houses on the bridge were burnt during Wat Tyler’s Peasants’ Revolt in 1381 and during Jack Cade’s rebellion in 1450. A major fire of 1633 that destroyed the northern third of the bridge formed a firebreak that prevented further damage to the bridge during the Great Fire of London (1666). By 1762 all the houses were removed, the carriageway was widened to 14 meters (46 feet), and the two central arches were replaced by one great arch at mid-span. The removal of the central pier led to serious erosion of the riverbed, and gravel was constantly poured to protect the remaining piers. Finally the maintenance became too much of a burden, and the City held a design competition for a replacement of the medieval bridge. After many plans were submitted for tender the proposal by John Rennie was accepted. Although his design was used, it was his son, Sir John Rennie who actually saw it through to completion. His father, unfortunately died before the building work was even started. On June 15, 1825, the first stone was laid by the Mayor of London, John Garratt, in the presence of the Duke of York. Six years later, William IV and Queen Adelaide opened the New London Bridge and the old one was demolished. This London Bridge was built out of granite which was quarried on Dartmoor. It was a structure of 5 arches, and its overall dimensions were 283 meters (928 feet) long and 15 meters (49 feet) wide. In 1962, it was discovered that the London Bridge was “falling down,” sinking into the Thames because it was not adequate for the increase in traffic. When the decision was made to build a new bridge, the old one was put up for auction. Robert P. McCulloch, the founder of Lake Havasu City in Arizona, submitted the winning bid of $2,460,000 to buy the bridge. He then went on to spend another $7,000,000 to dismantle, move, and reassembled the bridge in Arizona. Today, the bridge serve as a tourist attraction at the resort town of Lake Havasu City. The current London Bridge was designed by architect Lord Holford and engineers Mott, Hay and Anderson. It was constructed by contractors John Mowlem and Co from 1967 to 1972, and opened by Queen Elizabeth II on 17 March 1973. It comprises three spans of prestressed-concrete box girders, a total of 283 meters (928 feet) long. The cost of £4 million (about £60 million in 2018), was met entirely by the Bridge House Estates charity. The current London Bridge is often shown in films, news and documentaries showing the throng of commuters journeying to work into the City from London Bridge Station. The nursery rhyme “London Bridge Is Falling Down” has been speculatively connected to several of the bridge’s historic collapses. Rennie’s Old London Bridge is a prominent landmark in T.S. Eliot’s masterpiece “The Waste Land”, wherein he compares the shuffling commuters across London Bridge to the hell-bound souls of Dante’s Limbo. 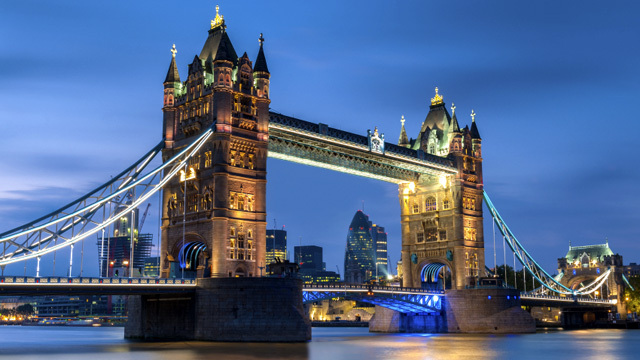 London Bridge is sometimes confused with Tower Bridge situated some 0.8 km (0.5 mi) downstream.